A lead acid battery is a secondary cell, meaning that it is rechargeable. It is very common in cars and trucks. It contains plates of lead and lead(IV) oxide in a sulfuric acid solution. The lead(IV) oxide oxidizes the lead plate, making an electrical current. Lead-acid batteries are the cheapest rechargeable batteries and can produce much power. They contain toxic lead, though, and should be recycled. They are wet cells, and the dangerous acid can spill out. 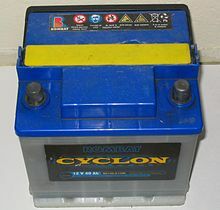 Sealed lead acid batteries are batteries where the sulfuric acid is in a gel which stays in, even when the battery is turned up side down. These reactions are reversed when the battery is charged. This page was last changed on 13 March 2014, at 13:45.